Tillerson said Germany, the U.K. and France were set to discuss the U.S.' concerns with the deal. European powers are ready to resolve American criticisms of the 2015 nuclear deal with Iran, according to Secretary of State Rex Tillerson. 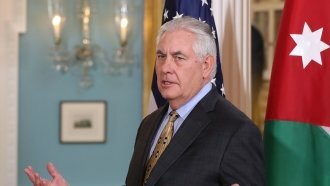 Tillerson told reporters in Warsaw, Poland, that three of the countries involved in the deal — Germany, France and the U.K. — agreed to working groups to go over parts of the deal the U.S. administration finds problematic. The nuclear deal was intended to keep Iran from pursuing nuclear capabilities in exchange for relief from sanctions. European powers had been reluctant to touch the deal, which was a landmark achievement at the time. But President Donald Trump warned he'd pull the U.S. out of the deal unless changes were made — specifically, closing loopholes that allow Iran to resume nuclear activity and tightening restrictions on Iran's ballistic missile program. Iran has said the deal is non-negotiable. China, Russia and the European Union were also part of the deal.